In Some Like It Strange, Zac, Paul and Elizabeth head off to New York, hired by the recluse, Flint McCormack, originally from Hayling Island, now in the Big Apple and acting strange and more than ever convinced that he’s the target of a kidnapping plot. Elizabeth is back in the stomping ground of her youth and it makes for some happy reminiscing, also the disclosure of a family secret which Zac has a little trouble accepting. The nasty piece of work from Paris, Etienne, is in town and possibly angling for revenge. Ross isn’t too far away and Paul has to confront his own demon. ‘King Kong’ makes an appearance, but that’s nothing compared to the drama that is unfolding elsewhere. Just so that you know, this case, being set in New York, is a double feature length one; well, everything’s bigger over there! 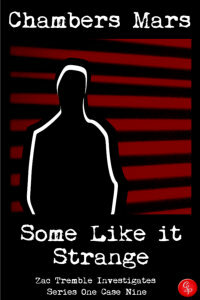 Some Like It Strange is the 9th Zac Tremble Case File in the series Zac Tremble Investigates; the case files of the gay, Soho-based PI Zachary Tremble. It follows on from, in order: Chrysalis, Metamorphosis, Transmutation, The Red Kimono, The Ephemeris Protocol, Delphes, Slip Knot and Hide and Seek. There are twelve case files in series 1. And if you can’t wait for the first twelve cases to appear individually, then Jury’s Out is also available – Jury’s Out is the complete first series.